For years my family kicked off the holiday season with a weekend of togetherness and Christmas shopping in Chicago. The trip just wouldn’t be complete without a meal at RL. Our agenda sounded a bit like this: get up, eggs benny, shop, eat, shop, eat some more – it was just the thing to put everyone in the festive spirit. 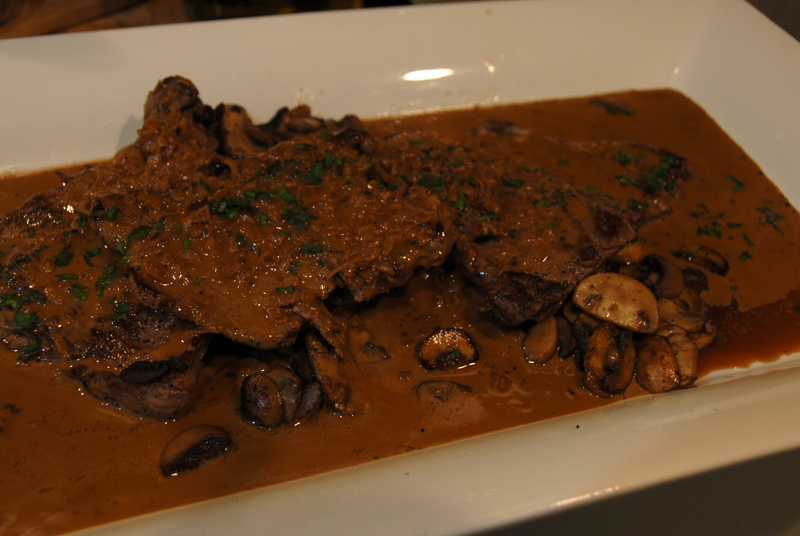 Being that we haven’t made our annual holiday pilgrimage to the windy city for the last two years now my Mom and I were beginning to have a real hankering for this steak Diane. After some extensive research and calling on my (and my family’s) memory I came up with the following recipe. You might think a flambe, rich pan sauce, and filet mignon might be a little too much to attempt in a home kitchen but honestly, it’s really quite simple, and elegant, and divinely delicious (need I go on? just try it already!). 1 1/2 cups reduced beef stock – the real deal calls for reduced veal stock but being that the holidays were a little hectic I opted for (cough, boxed) organic beef stock. Boil to reduced to about 1 1/2 cups. 1 lb. mushrooms, sliced thinly – I can’t recall if RL’s version has ‘shrooms but the folks I was feeding Tuesday night love mushrooms and I knew they’d work beautifully with the sauce so I figured hey, why not! This dish moves pretty quickly so begin by prepping well. 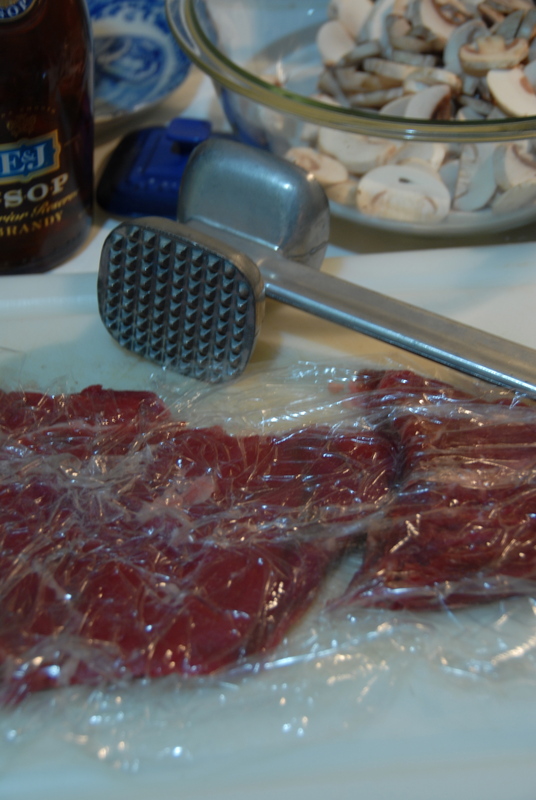 Mince the shallots, chop the mushrooms, pound the pieces of meat thin (about 1/4 – 1/2 inch thick), gather your condiments. 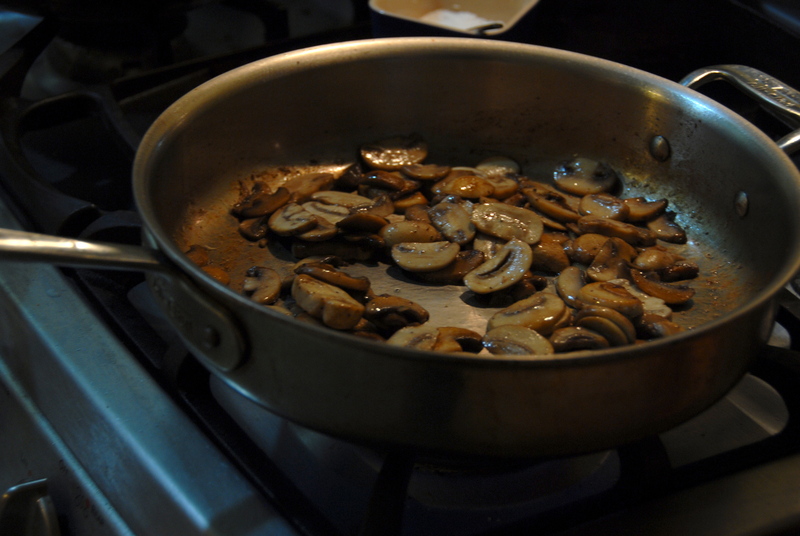 In a shallow saucepan or large saute pan cook the mushrooms in butter, set aside and cover (be sure to season with S&P!). Season the meat with S&P on both sides. Sear it in the same pan you cooked the mushrooms in, along with some more butter – see how much flavor you’re building in that pan! Since the pieces are quite thin they will cook quickly. About a minute and a half on each side. Set aside and cover. Now for the sauce. Add yet another tablespoon or so of butter to the same pan. Over medium heat sweat shallots. After a few minutes you’ll want to add the brandy. You can do this one of two ways. 1. Full on flambe – add the brandy (not from the bottle!) to the hot pan, tilt it away from you to ignite the booze and let it die out on its own or 2. add the brandy to the pan but don’t let it go up in flames, it will gently cook out. Making sure the cabinets stayed in tact at my sister’s house where I was doing the cooking I simply added the brandy, scraped the pan to pick up all those tasty bits and then after a couple minutes added the reduced stock. Next add the Worcestershire sauce and adjust seasoning. Whisk in the mustard and then finally the cream. 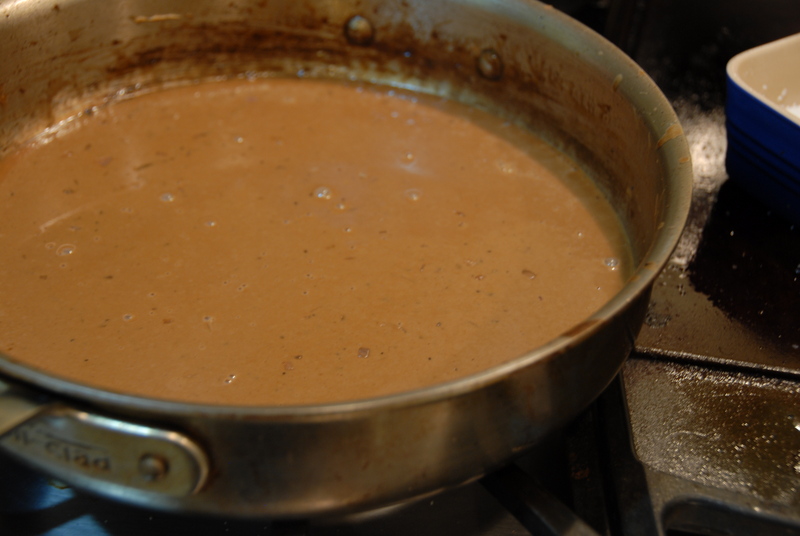 Let the sauce gently simmer for a minute or two for the flavors to meld. Check once more for seasoning and that’s the sauce! Diane: silky, slightly tangy from the Dijon, absolutely rich and luxurious. In another pan (or in the sauce if you wish) quickly reheat mushrooms and filet. Pour the sauce over both the mushrooms and meat and enjoy. It doesn’t hurt to top it all with finely chopped parsley. Dig in while it’s hot! It’s absolutely divine. This entry was posted in Beef, Festive Cheer and tagged Chicago, cream, Diane, Dijon, meat, pan sauce, RL, steak. Bookmark the permalink.